Emory University Hospital announced on Monday that another American infected with the Ebola virus will arrive today for treatment in the same isolation unit where Kent Brantly and Nancy Writebol were treated last month. 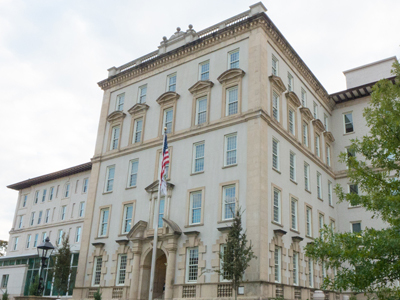 The yet-to-be-named patient is the third patient treated at Emory and the fourth patient to be treated in the United States, with the other patient undergoing care in an isolation unit in Omaha, Nebraska. The first two patients, Texas-based physician Brantly and Writebol, a Charlotte, N.C. aid worker, arrived at Emory on Aug. 2 and 5, respectively. According to the hospital’s official statement, shared Sept. 8 on Emory’s Facebook page, a patient is being airlifted from West Africa to Emory sometime Tuesday morning. The statement goes on to say that the hospital is bound by patient confidentiality and has no information regarding the status of the patient. As reported in an Aug. 29 Wheel article, Emory’s isolation unit is physically separate from the rest of the community and is run by a team highly trained in specific and unique protocols and procedures necessary to treat and care for Ebola patients. “Emory University Hospital has a specially built isolation unit set up in collaboration with the Centers for Disease Control to treat patients who are exposed to certain serious infectious diseases,” Associate Vice President of Communications Vince Dollard wrote in a July 31 all-Emory email. According to World Health Organization numbers released on Sept. 5, the disease has killed 1,089 people among 1,871 cases in Liberia, and 2,097 out of 3,944 cases overall. Currently, there is no cure for Ebola, although ZMapp, an experimental treatment, was given to Brantly and Writebol. While Brantly and Writebol did recover, the treatment has only been tested on monkeys and did not conclusively lead to the patients’ survival, according to an ABC News article. Brantly was released from Emory University Hospital on Aug. 21, where he spoke at a press conference about his experimental treatment, ZMapp, and the level of care given to him by the Emory team. Writebol was released from the hospital on Aug. 19.